Activate Schools is Activate Good’s initiative to empower the next generation of young volunteers and community leaders through the people, educational institutions, and youth organizations that engage them daily. Educators, youth leaders, and parents know best that inside every kid lies the potential to change the world! 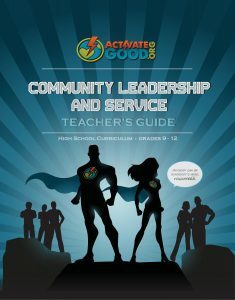 Activate Good started engaging youth through local high schools in 2008 with the design and introduction of our Community Leadership & Service Curriculum as a class option. Why? To help youth recognize their potential to do good by giving them an extensive opportunity to learn about the causes influencing everyday life, and dedicated time to think about ways they can actively make a difference. One of the best places to start that growth and critical thought is in institutions that welcome youth each day. But we’ve grown too and there’s more work to do – and many ways to help youth realize their potential in school, extracurricular groups, and more! Of course, our eight-unit Curriculum is a great resource for high schools and other youth organizations (locally and elsewhere) that are looking to deepen their impact in subject areas like civics and current events with real world application. But the curriculum also uses activities designed to bolster such student skills as money management, public speaking, researching, planning, writing, networking and teambuilding, and more. The best part about the curriculum is that it’s designed with the diversity of students in mind; while we suggest a single class runs the course of a full academic year in high school grades 9-12, the Curriculum can be adapted to suit different time frames and setups, as well as younger ages and learning abilities. Interested? Click HERE to learn more, download a sample, purchase the full Curriculum, learn about Partnership potential for local users, and other resources. It’s okay to start small. The first step to getting students engaged in volunteerism is to simply encourage service and make it as easy as it should be. Activate Good offers free service project matching and referral support to youth groups of all types, as well as individual teens. We’ve matched youth groups, schools, and whole grade levels with headcounts in the hundreds! So if you’re ready to get out there, Request a Referral and learn how you can support our cause in return! If you’re ready to get a group (or several) volunteering in one of Activate Good’s three annual Days of Service, learn more HERE. Again, we’ve matched groups with headcounts in the hundreds. But we’ve also planned and co-lead whole community days for local schools – real, no-student-left-out days of service. 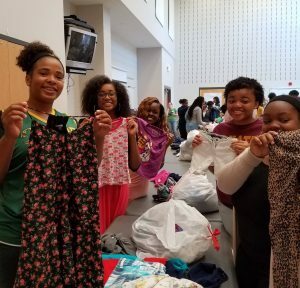 Hosting a full day of service is one of the best ways to engage the entire community in the school, facilitate service learning and student relationships, and demonstrate real needs in the community that surrounds you – all while helping others. How does it work? First, we listen to your needs and goals. Then we prepare a proposal with options for your service day that fit your budget and other specifications to the best of our ability. Once approved, we handle all the planning and logistics (coordination, purchasing, deliveries, communications, etc.). Then we implement the project, actively leading your volunteers and service day. Finally, we demonstrate all the hard work of your volunteers in a handy, one-page impact report, sent to you by PDF. Want your own day of service? Let’s chat! Complete the form HERE and we’ll be in touch. We have volunteer groups that request custom service projects all the time, and some even have budgets. If you know your school can use some volunteer help, review and complete this form. Learning about the community issues they’re impacting. Clarifying their emotions and thoughts throughout the volunteer process. Articulating their specific impacts and how they’re connected to other impacts. Recognizing their potential for growth and to do good. Like what we’re doing? Please consider making a one-time contribution HERE to help us continue offering the free services mentioned above. We appreciate your support!